It's impossible to bring up the topic of great ODI players and not have Viv Richards mentioned as one of the first names. Even in today's age of big bats, small boundaries and ridiculously audacious strokeplay, Richards' numbers stand out: an average of 47 and a strike rate of 90.20 from 187 matches. Thirty-nine batsmen have scored more ODI runs than him, but hardly any have done it with as much flair. Certainly none of his contemporaries did as much as Richards in this format. The pundits who saw him in his pomp say that numbers don't do justice to the way he batted, but one look at his stats tells you just how phenomenal he was. When he finished his ODI career - on May 27, 1991 - he was the second-highest run getter in the format: only Desmond Haynes had scored more (6779) but at a strike rate of 64.20, 28% slower than Richards' 90.20. Of the top ten run scorers at that point, only two others had a strike rate of more than 75: Dean Jones (76.25) and Allan Lamb (75.56). Of the five quickest 100-plus scores made till then, three belonged to Richards. His 11 centuries in ODIs were made at a strike rate of more than 80, with seven of those innings being faster than a run a ball. His slowest 100-plus score - against India in the 1983 World Cup - came at a strike rate of 81.50, and was still faster than 24% of all 100-plus scores made till then. 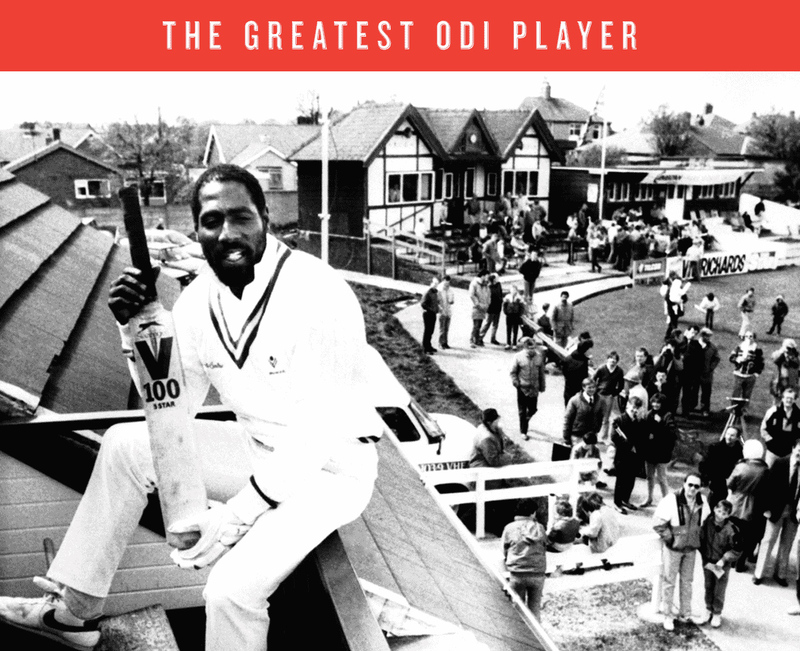 Richards' greatness in the 50-over format mainly lies in the extent to which he was ahead of everyone who played in his era. The table below illustrates that, and shows that when his numbers are adjusted for the period he played in, he is greater than all batsmen across all eras. Richards averaged 47 and scored at a strike rate of 90 in a period in which top-order batsmen (those batting in the top seven) averaged 29.38 and scored at a strike rate of 65.96. Multiplying the average by the runs per ball, the average batting index during that period was 19.38, but Richards' was 42.39. His index was thus more than twice as much as that of the average top-order batsman in his era. The closest anyone has come to that ratio is South Africa's AB de Villiers, who averages 52.90 at a strike rate of 98.64 after an incredible last few years. His average and strike rate are both higher than Richards' in absolute terms, but when taken in the context of the era he is playing in, they are still slightly below Richards' numbers. MS Dhoni and Virat Kohli are next on the list, with Sachin Tendulkar in sixth place and Adam Gilchrist tenth. One of the key attributes of Richards' greatness as an ODI batsman was that he scored against all opposition in various conditions. He averaged 51 against Australia, 58 against England, 47 against India, and 54 against New Zealand; in Australia he averaged 45, in England 64, and in India 42. The only team against which his numbers dropped a notch was Pakistan: in 39 innings against them, his highest score was 83 and his average 30.82. Pakistan were the only opposition against whom he played more than one innings and didn't score a century. Against all other teams, his stats are outstanding. Richards was also spectacular in the biggest ODI tournament, the World Cup. He played four of them, and averaged more than 65 in three - in 1979, 1983 and 1987. In the 1975 tournament he scored only 38 in four innings, but contributed with his electric fielding, effecting three run-outs in the final. In 1979 he scored an unbeaten 138 in the final, and he also scored a century each in 1983 and 1987. 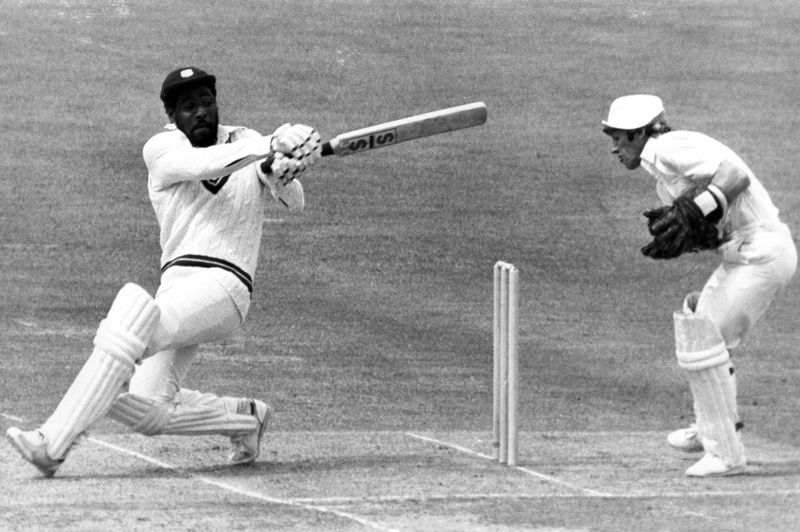 Among batsmen who have scored at least 1000 World Cup runs, Richards' tournament average of 63.31 remains the highest. In 187 matches, Richards the Man-of-the-Match awards 31 times, another indicator of the impact he had. His rate of one such prize every 6.03 games is the best among players who have won at least 25 MoM awards; the next best is Tendulkar's rate of one award every 7.47 matches. Add all these aspects - how far ahead he was of his contemporaries, his consistency against opponents and conditions, and his penchant for big matches - and it's hard to look beyond Richards when selecting the best ODI player of all time.